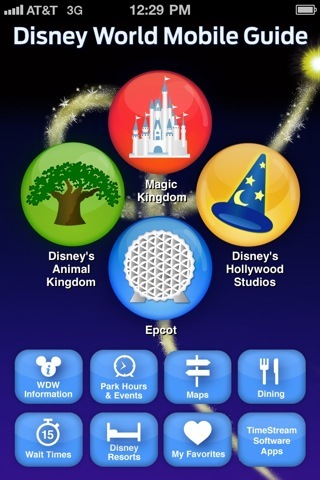 TimeStream Software announces an update of its Disney World Mobile Guide app for the iPhone, iPod touch and iPad. Featuring a comprehensive list of trip-planning and in-park resources in an easy-to-use design, the app provides users with wait times, interactive maps, restaurant listings, menus, park hours, parade and event times, ride descriptions, Disney hotel information, phone numbers, over 300 pages of valuable information and much more, all complemented with over 600 high-quality photos. Portland, OR – TimeStream Software announces an update to its highly acclaimed Disney World Mobile Guide app for the iPhone, iPod touch and iPad. Recognized as one of the top apps available for Walt Disney World Resort, the new Disney World Mobile Guide Version 1.7 features a wealth of valuable trip-planning and in-park resources, including wait times, interactive maps, restaurant listings, menus, park hours, event and parade times, extensive ride descriptions, Disney hotel information, phone numbers, over 300 pages of helpful information and much more, all in a colorful and intuitive interface filled with over 600 high-quality photos showcasing the parks. The Disney World Mobile Guide app is one of the most comprehensive mobile vacation planners and in-park guides available for Walt Disney World Resort today, covering nearly every aspect of the entire resort and all four theme parks, including the Magic Kingdom, Epcot, Disney’s Animal Kingdom and Disney’s Hollywood Studios. * Detailed Interactive Maps – Look great on the iPad! * And more…all with photos! The new Disney World Mobile Guide app is native to the iPhone and iPod touch, so users always have access to the content and do not have to rely on a Wi-Fi or cell signal. As a result, it works flawlessly throughout all four Walt Disney World theme parks, Disney hotels, restaurants and off-property. The Disney World Mobile Guide for the iPhone and iPod touch is available now at the iTunes App Store. Designed for the iPhone and iPod touch. Compatible with the iPhone, iPod touch and iPad. Walt Disney World Secrets Gold! Regularly $4.99, the Disney World Mobile Guide is on sale for only $2.99 for a limited time during Spring Break. 77 Days til Disneyland – The Bakery Tour! If there is one thing that my daughter and I both agree on, it is the wonderful taste that Sourdough bread has! At Disney’s California Adventure Park, you can take The Bakery Tour, taste some delicious bread, see how it is all made, and then, at the end, you can purchase some great treats at the Pacific Wharf Cafe to share later on! While this certainly isn’t a thrill ride or an e-ticket attraction, the Bakery Tour is certainly something unique that you won’t really find anywhere at Walt Disney World! So indulge yourself, slow down for a bit, and enjoy the tour! To see the rest of the entries in our 100 Days til Disneyland countdown series, check them out by clicking on the link, and thanks for stopping by!